If you're in need of any of our services, get in touch with us right away. Rely on our family-owned company for stone services. 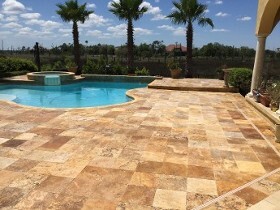 There are many good reasons to consider having a hardscape added to your property. For those with large properties, adding a driveway from the road to your garage is an excellent investment that makes leaving and entering your property by vehicle significantly easier. Hardscaping your outdoor areas adds value and functionality to your yard, whether it's a retaining wall, a patio, or a fire pit. The possible choices for your hardscape are limited only by your imagination and budget. If you're interested in making a change to your yard, we'll help you come up with a comprehensive hardscape installation design plan. Adding a stone hardscape to your property can seem like a daunting proposition. In order to ensure that everything's done correctly, it's important to work with the right contractor. Fortunately, our experienced and reliable company is here to make sure that your hardscape comes out exactly as you'd imagined it. As our customer, you deserve superior hardscaping services and that's exactly what we deliver on every project. Contact us when you need hardscape services. We serve our customers in Jacksonville, Ponte Vedra Beach, Jacksonville Beach, Atlantic Beach, and Neptune Beach, FL.